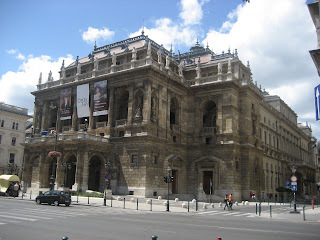 We got to Budapest after a long and hot train ride from Zagreb, arriving about 4:30pm. The scenery from the train was mostly rural. A significant part of it went along a huge Hungarian lake - Lake Balaton. Apparently, this is the place where Hungarians go to relax in the summer. It is also an important wine region that produces good reds and whites as well. We got to our hotel (Charles Hotel) by bus from the train station. We kept our eye out for pick-pockets having heard that they hang around the train station. But it seemed okay. Apparently, the government has improved security around the railway station. After checking into our hotel, we decided to try out their restaurant. Per recommendations of our waiter, we had two Hungarian dishes - a Goulash and a paprika stewed veal with gnocchi. Quite tasty but a bit salty. The following day we put our hiking shoes on and walked all around. 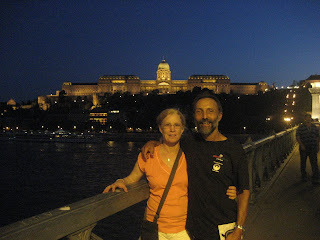 We started out on the Buda side of the city by seeing the Buda Castle and its caves. These are a labyrinth of caves about 1200 meters long, in limestone, dating back a half million years when they were naturally created through water flows. 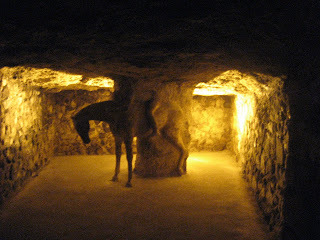 The caves were used in medieval times to as current as in the days of the Cold War. Very cool and at times eerie, but it was nice to get cooled off from the heat outside. 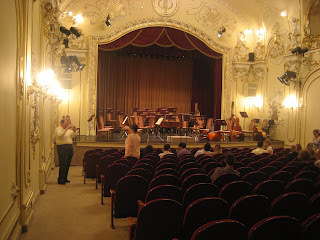 That night we went to a concert by the Danube Symphony Orchestra at a beautiful Duna Concert hall. The orchestra played lively Hungarian and Romanian folk dance music and works by Haydn, Liszt, Berlioz, Brams and Strauss. One of the orchestra members played a cimbalom, a traditional Hungarian instrument that's played like a zylophone and sounds a bit like a piano. It was a really good show with some of the music definitely having that vibrant Gypsy feel to it. Budapest has lots of bridges. One morning we started off rather late, but again we managed to do quite a bit of walking on both sides of Buda and Pest. 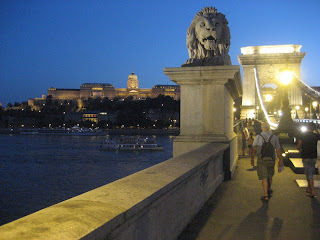 We criss-crossed the Chain Bridge and one other one and saw the St. Stephen's Basilica, the Opera House, the Fisherrman's Bastion (a Romanesque looking castle with a great panoramic view of Pest, and other sights. We went to a very nice wine cellar and bought two wines that are distinctly Hungarian: a white Vorcsoki Furmint and a red Egri Bikaver. We opened them that night. Both were very good. Another day we got a chance to just taste some Hungarian wines. We found a small restaurant on the Pest side, Klassz, that was willing to give us small tastes of some of Hungarian's better reds. Unfortunately, there aren't many opportunities to just sample wines of the region - usually you need to get the entire glass or bottle. But this place helped us out. At the end, the manager didn't even charge us for the tasting. We told him that he needed to develop this type venue for wine lovers. Overall, we're really enjoying Budapest. We find the Hungarians to be very friendly and helpful. Many speak excellent English. I'll post this as Part I - since we're staying in Budapest for five days.